Made of thick Eco-Friendly transparent PVC - Clear, durable, waterproof and easy to wipe clean. Thoughtfully Design: The transparent design allows you to easily find what you need-CLEAR AT A GLANCE.And the leather can keep your private items. Fashionable: Special material. No matter where you go, catch eyes everywhere when you go with it! Convenient: Compliant with TSA 3-1-1 rules and regulations of all airlines.Making the security process go more fast and smoothly. Portable: Lightweight and equipping 2 sturdy and comfortable padded adjustable straps,easy to carry. A clear bookbag for school(primary school, middle school, high school, college). A laptop backpack designed for work. A clear bags set for travel. A convenient backpack designed for Disney, Airport, Stadium, Concert and any occasion where security check is required. If you are looking for bag set,you will get what you want ! 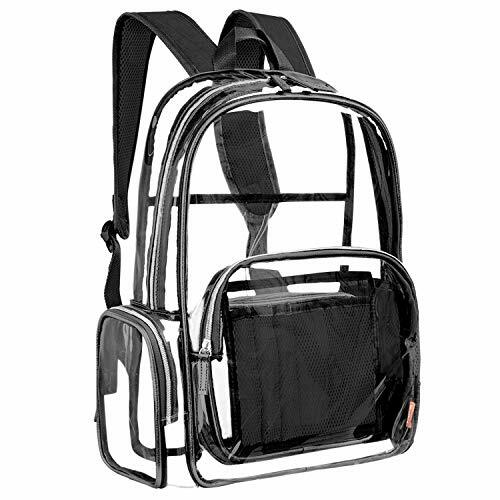 1 x Clear Backpack - 16.5 x 13 x 5 inch. 1 x Laptop compartment can fit most 15.6 inch laptop/notebook. 1 x Front zipper pocket includes 1 pocket and 4 mesh slots. 1 x Clear bag - 8.7 x 6.3 x 2.3 inch. NOTE: New bag come with material smell. Please don\'t worry about, just put the bag on an airy space for a while. Due to lighting effects/monitors difference,the true color might be slightly different from the photos. PVC material may stick each other at summer vocation because of the features of the PVC material and the hot weather. That is a normal phenomenon.It will get better at winter.